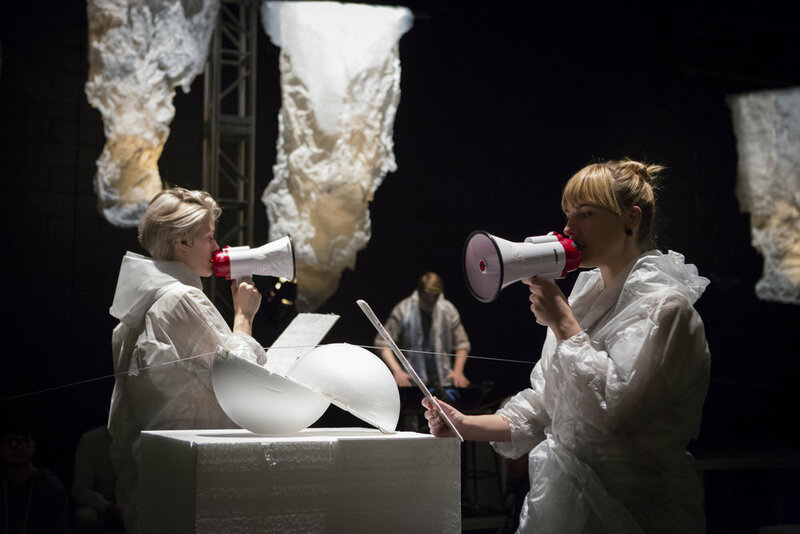 The Force of Things: an Opera for Objects is an immersive work of music theater that wrestles with the animate vitality of matter and the mounting hum of ecological anxiety around us. The project is driven by a desire to tune our focus toward a rate of change (impossibly slow) and a scope of alteration (unthinkably vast) at odds with the scale of human life. 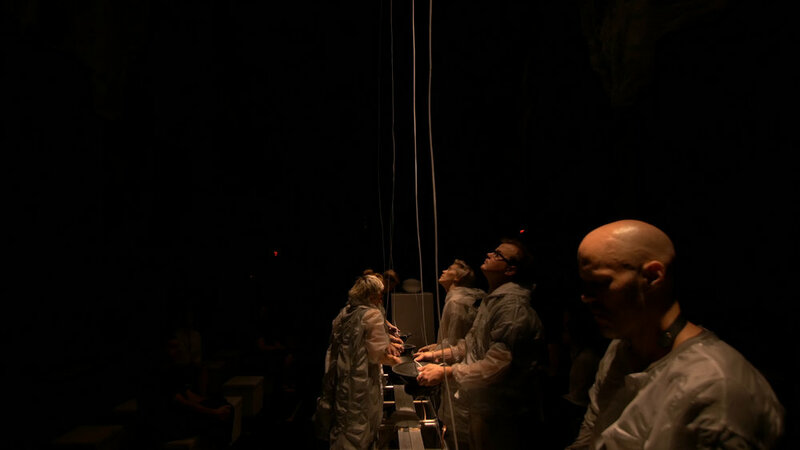 Audience members enter into a field of sculpted matter ringed by speakers emitting sounds too low for humans to hear. Though they vibrate under our threshold of audibility, this choir of subwoofers causes waveforms that ripple through and sonify the material space. 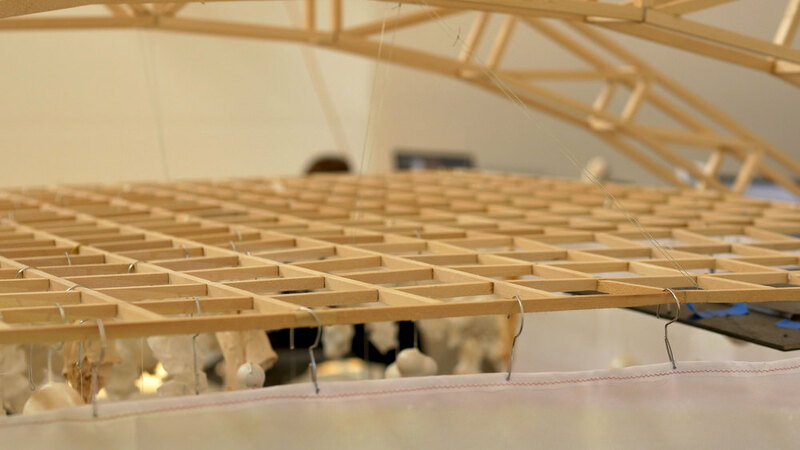 Aircraft cables, tensioned web-like across the 150-foot performance space, double as infrastructure and instrument when bowed like mammoth double basses. Two singers snake side-by-side amidst the audience, shouting a warning that sounds like a whisper in a language no one can understand. The piece has a palpable sense of urgency and yet it’s eerily still, as if the timescales are off, as if some future frantic state reaches us only in slow motion. These moves attempt to train our perception beyond its given boundaries—below the sounds we’re built to hear and through the sensory illusion of stasis that renders us still in the face of collapse. The Force of Things was made possible by generous commitments from the International Contemporary Ensemble: First Page Program, University of Michigan Office of Research, Taubman College of Architecture and Urban Planning, Dartmouth College Provost’s Office Seed Funding Program, the Neukom Institute at Dartmouth, the Office of the President at Dartmouth College, the Dean of the Faculty for the Arts and Sciences at Dartmouth College, Miller Theater at Columbia University (NYC), and Internationales Musikinstitut Darmstadt (IMD), New Music USA, and the Ernst von Siemens Musikstiftung. The Force of Things premiered at the Darmstadt Summer Courses for New Music in August 2016. Peak Performances at Montclair State University hosted its American Premiere in four sold out shows in October 2017, and Lincoln Center’s Mostly Mozart Festival hosted 6 sold out shows at Brooklyn’s Gelsey Kirkland Arts Center in August 2018. Creative Team: Ashley Fure (composer), Adam Fure (architect), César Alvarez and Lilleth Glimcher (co-direction), Ross Karre (producer/percussionist), Levy Lorenzo (engineer/percussionist), Nicholas Houfek (lights), Alice Teyssier and Lucy Dhegrae (voices), Ryan Muncy (saxophone), Rebekah Heller (bassoon), Dustin Donahue (percussion). 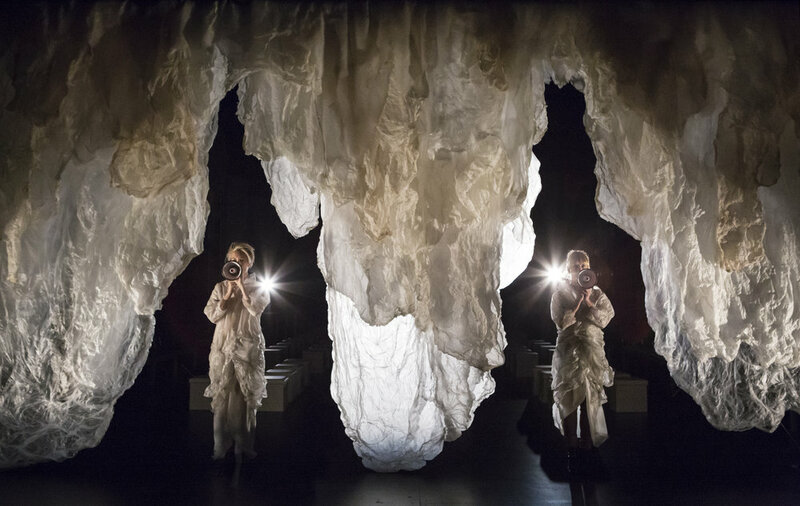 Photos (2 ,3, 4, 5, 6) below by Marina Levatskaya, courtesy of Peak Performances at Montclair State University. All other photos and video by Digitice Media Team.